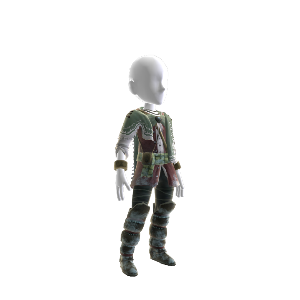 Outfit your Xbox LIVE® Avatar with the magnificence of Assassin’s Creed® III’s multiplayer character skin, The Silent Shadow. Feel the Native American spirit from the heels of your feet to the top of your head when you don his full-leg moccasin boots, epic battle cape and feather accents. Look the part. Play the part. Only from Assassin’s Creed III. Log på for at se dette på din avatar.